For the first time in recent years, every single competitor in the Ladies’ discipline at the 2015-2016 ISU Grand Prix Final has won a Grand Prix event this season. In addition, the season’s best overall scores for all but one lady in this Final is above the 200-point mark. Fans are anticipating an interesting and somewhat unpredictable ladies’ competition when the short program starts Friday in Barcelona, Spain. The gold standard for the ladies’ field are multiple triple-triple or double Axel-triple toe combinations. The six finalists here will attempt 18 such combinations over the course of the competition. Evgenia Medvedeva is the latest debutant in an already deep Russian senior ladies’ field. Medvedeva’s Grand Prix at Skate America (SA) followed an undefeated junior international season that included a Junior World Figure Skating Championship title. Medvedeva has sought every opportunity to rack up the points. All three jumping passes in her short program to Issac Schwarz’ “Melodies of the White Nights” are after the halfway mark, giving her a 10 percent bonus in the jumps’ base value. The 16-year-old has seven jumping passes, including a triple-Salchow-triple toe loop combination, in her free skate to a musical selection from the W.E. soundtrack and Rene Aubry’s “Allegro”—five of which are in the second half. Numerous transitions and tanos (when she lifts her arm over the head during some of the jumps) ups her Grade of Execution (GOE) mark. As a result, it should come as no surprise that the reigning Russian bronze medalist currently has the highest technical element score (TES) in the short program (39.66) and the free skate (72.12), as well as the highest free skate score in the Grand Prix series. Last season’s Junior Grand Prix Final champion is also a steely competitor. When she fell on a triple flip and missed the triple-toe combination during the short program at Rostelecom Cup (RC), she added a triple toe loop to her planned solo triple loop jump, which kept her in third place. She then won the free skate to earn silver overall behind Russian teammate Elena Radionova. If Medvedeva skates clean programs, she has a good shot to win the Final in her debut Grand Prix season, a feat last achieved by Yuna Kim, the retired Olympic Gold medalist from South Korea, in 2006. A year earlier, Mao Asada of Japan won the 2005 Grand Prix Final during her debut Grand Prix season, beating the then reigning World champion (and eventual bronze medalist at the 2006 Olympic Games) Irina Slutskaya of Russia. Asada, who was too young to compete in the 2006 Olympics, was in the same place as Medvedeva—a rising star with an impressive international junior resume and a triple Axel. A decade later, Asada is now the veteran of this year’s Final. This is the seventh outing in this event for the 25-year-old who medaled in her six previous appearances (she qualified for the 2011 Grand Prix Final, but had to withdraw due to the death of her mother). The six-time Japanese champion is no longer a precarious jumping prodigy, but a mature skater with beautiful lines, an elegant lyrical style and smooth step sequences and fast spins. She, deservingly so, has the highest component marks in the field. Asada, however, is as ambitious as ever with her technical content: She has attempted the triple Axel and a triple flip-triple loop jump combination in both her programs. She showed the perfect blend of artistry and technical difficulty during her short program to “Ei Mir Bist Du Schoen” at Cup of China (COC). There, she landed a beautiful triple Axel and her program components for that segment (34.65) is still the highest for the entire Grand Prix series. However, technical inconsistency has plagued the 2010 Olympic silver medalist this season. Asada has missed or under rotated all but one of her triple flip- triple loop attempts. She hit both her planned triple Axels at her first event, Cup of China, but then missed both of them at NHK Trophy (NHK). She also continues to struggle with the edge on her triple Lutz in which she has received either a wrong or unclear edge call on all but one, and has popped the jump on half her attempts. Several mistakes in an otherwise beautiful free skate to Madame Butterfly at Cup of China led to a second place finish in the segment (though she won overall) behind teammate Rika Hongo. She made mistakes in both programs at NHK, leading to a disappointing third place finish behind teammate Satoko Miyahara and USA’s Courtney Hicks. Asada’s technical struggles are reflected in her scores: She has the lowest season’s best overall score out of the Final qualifiers and is the only skater here to not break the 200-point mark this season. Nevertheless, the three-time World champion is a fierce competitor and could make a major comeback. During the 2014 Olympic Games in Sochi, she came back from a dismal 16th place short program with a thrilling third place free skate that helped her move up to sixth place overall. A month later, she won her third World title in her home country with a new World short program record score (78.66) that still stands today. In short, don’t count Asada out for a podium finish or even a possible win at this competition. Russia’s Elena Radionova is only 16, but was overshadowed early on by the stellar rise of the slightly younger Medvedeva. When she finished third at Cup of China behind Asada and Hongo, it appeared she was on the decline. However, she showed she still was a top contender at Rostelecom Cup (RC). She skated with great passion during her short program to Lara Fabian’s “Je t’aime” and had tears of joy when she finished. Fans were highly skeptical of her free skate to “My Heart Will Go On,” the popular song from the 1998 movie Titanic. Voiceovers from the movie by actors Kate Winslet and Leonardo DiCaprio layered over Celine Dion’s vocals added to the cheese factor for fans. At Rostelecom Cup, Radionova again skated her heart out to that score, and when she finished, fans were more than willing to buy what she was selling. She lost the free skate to Medvedeva, but her lead from the short program was enough to win the overall competition with the highest overall score (211.32) in the Grand Prix series. Radionova has two different triple-triple combinations, a triple Lutz-triple toe loop that she does in both programs and a triple loop-single loop-triple Salchow in her free skate. Radionova does struggle with the edge of her flip, but the technical panel has deemed that her flip has an unclear, rather than the costlier “wrong” edge. With Asada’s return to competition, it looked like Satoko Miyahara would be in her shadow despite being the reigning World silver medalist. However, the 17-year-old grabbed fans’ attention when she beat Asada at home at NHK with a set of new personal best scores. The most glaring issue with Miyahara is her small jumps, which are sometimes under rotated. The reigning Japanese champion mitigates that issue most of the time through rotating her jumps quickly, but the tactic doesn’t always work. Still, she manages to receive a positive Grade of Execution (GOE) score through her transitions in and out of the jumps. Despite her excellent skating skills, Miyahara currently has the lowest program component scores in this Grand Prix Final field. Even her new personal best program component score of 65.88 at NHK is still several points below what others have earned during the Grand Prix. Nevertheless, the two-time Four Continents silver medalist continues to work on improving her program components. She shows a flirtier and fierce side in her short program to “Fire Dance” from the Riverdance soundtrack. Her free skate to Franz Liszt “Un Sospiro” is elegant, but may seem similar to many of her past classical programs. However, despite her ongoing challenges, Miyahara is consistent—a key to her career success. The Kyoto native will likely be off the podium if others are clean, but it’s more than probable that her consistency will help her get on the podium instead. Rounding out the Grand Prix Final field are two U.S. Champions: Gracie Gold and Ashley Wagner. At 24, Wagner is the another veteran competitor in this field, having debuted in the Grand Prix Series back in 2008. However, the reigning and three-time U.S. champion is out to prove that she can still compete with the sports’ rising stars. The 2014 Olympian made the case for such when she won Skate Canada (SC) in October. There, she broke the 70-point barrier for the first time after a flawless and entertaining samba short program to Club des Belugas’ “Hip Hip Chin Chin” that featured a triple flip-triple toe loop and two solo jumps in the second-half of the program. Wagner had under rotations for both her triple-triple combinations in a reworked version of her Moulin Rouge free skate from last season. Despite those mistakes, she still broke the 130 mark (free skate) and the 200 mark (overall) for the first time. But Wagner’s inconsistency, which has kept her from the podium at several World Championships, made its comeback at NHK. In the short program, she had a wonky landing to her triple flip and could not complete the planned triple-triple combination, settling for a wonky triple Loop-double toe loop instead. To Wagner’s credit, she continued to sell the program, which prompted judges to give her the highest program component marks of the segment, including over a flawed Asada. Wagner also made several more jump mistakes in her long program, including missing another triple Flip-triple toe combination attempt and an under rotation on her Salchow on her second triple-triple combination. She attempted to add a triple toe loop to a triple Lutz to make up for the combination missed earlier in the program, but that jump was also under rotated. But like Asada, the three-time Grand Prix medalist is a fighter and fierce competitor and certainly can make a comeback during her fourth straight trip (fifth overall) to the Final. Wagner could join an exclusive group of skaters by winning a fourth consecutive Grand Prix Final medal here, but she needs to keep those under rotations at bay. The Californian also needs to be careful not to lose points either through lost spin levels, which she has done so previously, or a wrong edge on her triple Lutz. For some, it’s hard to believe that Gracie Gold will step on the ice Thursday in her first Grand Prix Final event after four seasons in the Grand Prix series. The 20-year-old actually qualified for the Final last season, but had to withdraw due to injury. The 2014 U.S. Champion is arguably one of the world’s best jumpers, but her inconsistency has kept her from getting the big prizes, namely a World medal. She also has had edge calls on her flip in the past (though she managed to avoid those calls this season). Despite this, Gold has an ambitious goal: winning the upcoming World Figure Skating Championships in Boston, close to her birthplace. The first step toward that gold is two programs that are a departure to the numerous princess programs she’s skated to in the past. Many believe her short program (tango program to Angel Villodo’s “El Choclo”) and her free skate (to Igor Stravinski’s Firebird) provide a better display of Gold’s power and big jumps. During the Grand Prix series, it appeared that Gold was learning to keep her competition nerves in check. At Skate America, she doubled her triple flip—a costly mistake as she earned zero points for that element— but was flawless everywhere else to stay in second place behind Medvedeva. In the free skate, Gold hit nearly all her elements, including a triple Lutz-triple toe combination and a double Axel-triple toe loop-double toe loop combination in the second half of the program to win the free skate (though she was second overall). Gold’s best performance of the season came at Trophee Eric Bompard (TEB) where she skated a flawless short program and earned 73.32 points, the highest for the Grand Prix Series. But she was denied the chance to win when the event was cancelled due to the Paris terror attacks. At the Grand Prix Final, Gold will have an opportunity to prove that she is becoming a more consistent competitor. Two clean programs will not only get Gold on the Grand Prix Final podium on her first try, but a medal result that would again prompt endless puns on its recipient’s name. 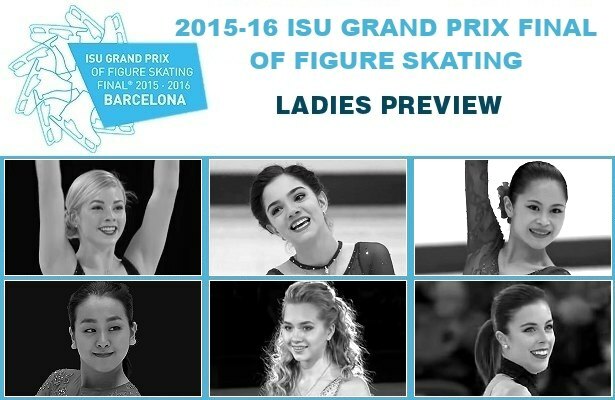 What’s your take on the Ladies qualifiers for the Grand Prix Final? Discuss here!